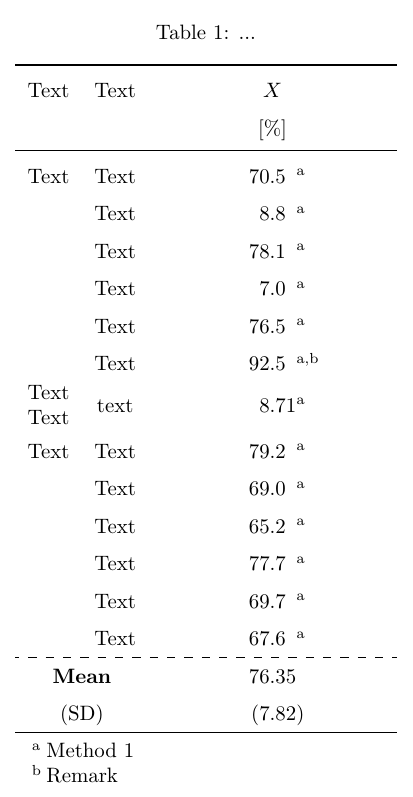 I have the table below with, \multirow, \multicolumn and \textsuperscript calls. I would like to have all entries centered, and the numerical entries additionally "scientifically" aligned right (as done by the siunitx package). For the time being I use \rlap, but that only aligns the text superscripts, not the numerical entries. Ideally, I should use something like the siunitx package, and in principle it should automatically align the textsuperscripts, but I am having trouble combining the siunitx package with my current code. Can anyone help? I have used siunitx's S column with an appropriate table-format option in order to align the numbers with respect to the decimal separator. For the notes, I have used the threeparttablex package and its ThreePartTable and TableNotes environments, as well as the \tnote command. Additionally, I have replaced the \hlines by rules from the booktabs package. I have also replaced the \multirow commands by a makecell command in the first column in order to achieve a similar layout without destroying the alignment in this particular row. Not the answer you're looking for? Browse other questions tagged longtable siunitx multirow multicolumn superscripts or ask your own question.